GECU has the challenge of operating within one of the nation’s most highly regulated industries, and as a result, has long understood that efficient processesfor employee training, development and performance management are critical pillars for supporting long-term financial growth within a strict regulatory and compliance environment. To support its employee development goals and meet evolving industry compliance requirements, GECU historically had turned to instructor-led training programs. 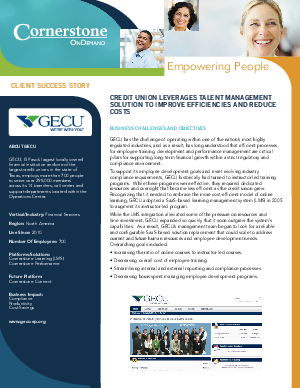 While these programs were effective, they required dedicated resources and oversight that became less efficient as the credit union grew.Recognizing that it needed to embrace the more cost-efficient model of online learning, GECU adopted a SaaS-based learning management system (LMS) in 2005to augment its instructor-led program.